A feature of the new gun was the possibility of using new, longer armor-piercing sabots with increased armor penetration. However, the APFSDS-T (Armour-Piercing Fin-Stabilized Discarding Sabot - Tracer) projectiles that NIMI had designed for the Vacuum project had a length of 900 mm. That is, they were guaranteed not to fit into the standard autoloader (AL) of Russian MBTs. The first and most obvious option is to abandon the existing designs of the automatic loader and go to the AL of a new type - horizontal. In it, the rounds (primarily APFSDS-T) are located horizontally in the conveyor, installed to the rear part of the turret. At the same time, there is a technical possibility to leave the classic AL, located in the turret, having placed in it HEAT, HE ammunition and guided missiles. Thus, a double-flow AL was obtained. 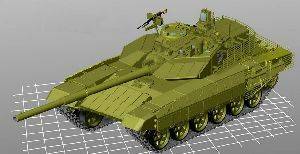 This idea was developed in the 1990s by designers from KBTM (Omsk, Russia), which previously specialized in engineering and auxiliary heavy vehicles and support the mass production of the T-80U MBTs at the Omsktransmash plant. In 2005, horizontal AL became the basis of R&D works on Burlak project. In practice, the unified turret with the new AL was too heavy and unreliable. It greatly changed the location of the center of gravity of the vehicle, which affected the driving characteristics and maneuverability. To install it during modernization it was necessary to extend the chassis upto seven road wheels per side. The issue of ensuring protection of bustle-mounted AL was also not resolved. But the main thing is the extremely high novelty of the design, which caused an increase in labor costs, life circle cost, and reduced the reliability of the structure as a whole. By 2009, this ptoject was closed. Modernization of the cabin type AL, which were used on T-64 and T-80 tanks, was immediately recognized as ineffective. Instead, it was planned to equip the Russian T-80 MBTs with Unified Turret or Unified Weapon Station developed in Omsk or Nizhniy Tagil (Russia). Attempts to place Vacuum APFSDS-T in AL of T-72 and T-90 MBTs continued. The decision to which the designers of Uralvagonzavod arrived during the Proryv-2 R&D, was simple and similar to that at which the Ukrainian A.A. Morozov KMDB involved on the T-64A MBT. 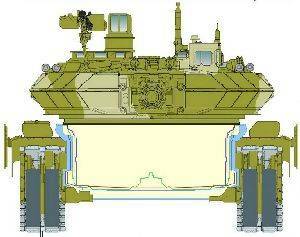 They cannot to fit it into existing hull of MDT, when modernizing AL. If the Svinets-1" and Svinets-2 APFSDS-T, having a length of 740mm, were still placed in the classic AL, then how it is possible to enter the Vacuum with a length of 900 mm? The difference in length between these ammunitions: 900-740 = 160mm. And so much space needed to be found in the width of the middle compartment of the tank hull, so that it would have entered a conveyor of increased diameter. The thickness of the T-72B and T-90 in the turret area is 80 mm. 80 + 80 = 160 mm! Then they just made small cuts in the sides, covering them with the corresponding armor plates from the outside! Simple and elegant solution. Similarly, in the KMDB, they milled T-64A aircraft in the AL area, and later began to stamp it. Only on the T-64 and T-80 due to the fact that the ammunition in the AL was located vertically, this stamping had a very large size. In the case of the Russian AL, the stamping was minimal. To ensure the shooting of Vacuum APFSDS-T was increased upto 12° loading angle. In AL first of all the conveyor case was changed. The mechanism for lifting the cassettes and the rammer were changed. For firing by rounds with length 900mm, the cartridge lifting mechanism bracket was made of a complex concave shape. This changed the trajectory of the lift and allowed to fit into the existing dimensions of the turret. The developed turret with the 2A82 cannon, with the above-described refinement of the tank hull, could be installed in both the T-90 and T-72, as well as in the upgraded T-80 MBTs. But this did not happen in practice. 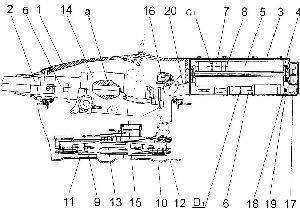 With the modernization of Russian tanks, guns of the D-81 type (2A46M-4; 2A46M-5 and 2A46M-6) are still used. 2A82 will not even be on the expected of the Russian army T-90M MBT. Just because, as it turned out, industry in Russia cannot produce it.